What's it like to live in the north Florida Tallahassee region? The qualities you consider when choosing a place to live are the same ones that make good sense for your business: a safe, clean environment, access to health care and education, employees with a good work ethic, affordable housing and the support of good neighbors. You’ll find all that – and more – in the Jefferson County region. Here in North Florida, the climate and history provide a particular charm for people who enjoy pastoral views of livestock, canopied roads and beautiful southern homes. “Rural” has new meaning for people moving here today. Sparse populations, low crime, people living close to the land who have an appreciation for hard work and a neighborly attitude, blend well with greater prosperity and education available to today’s workers. Our residents enjoy the best of rural living AND easy access to the “big city” amenities offered by Tallahassee, the nearby state capitol, or Thomasville, Georgia, a well-appointed town to the north. Within an hour, you and your family can enjoy great food, outdoor adventures and cultural events. Monticello is the county seat and is well-known for its historic homes and buildings. The downtown area is designated a National Historic District. It is also well-known for its festivals and public events. The annual Watermelon Festival, Halloween Haunted House tours and Christmas village re-enactment are examples. 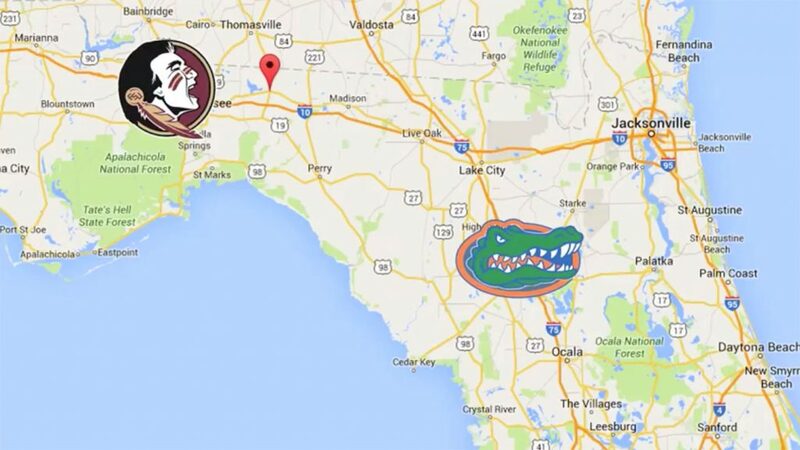 Jefferson County is located between two, high-ranking, long-time rival college football teams, the University of Florida Gators and Florida State University Seminoles. Occasionally called the ‘Sunshine Showdown,’ this rivalry gives sports fans the opportunity to show their pride in the oldest Public Universities in Florida. Abundant natural features, including lakes and rivers, First Magnitude springs and forests provide opportunities for outdoor activities. The County recently designated a 4-loop Heritage Road System, consisting of four distinct trails all beginning and ending in Monticello. Hundreds of bicyclists from across the Southeast are attracted to these and other scenic rides, making the community a true destination for cyclists. Whether you are a fisherman, hunter or golfer, you will find venues for your favorite pastime nearby. For updates on things to do within Jefferson County, visit our Tourist Development site. 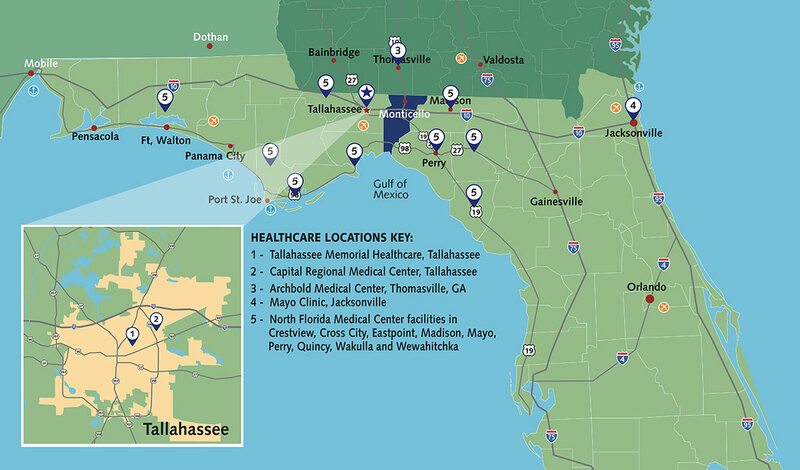 Local, regional and world-renowned healthcare institutions are available for you and your employees. Jefferson County has a moderate climate. Summers are long, warm and humid. Winters are mild to cool. The Gulf of Mexico moderates maximum and minimum temperatures. Annual rainfall in the county averages about 55 inches. Rainfall is heaviest from June to September; about 44 percent of the annual rainfall occurs during this period. Moderately intense rains of long duration occur in the spring. October and November are the driest months.